Madeleine Vionnet by Betty Kirke. A book I had been stalking on Amazon and a Christmas gift from my mother in law...and the most glorious sewing read. I was completely floored because I thought it was a modern dress (those side slits! So risqué!) I couldn't believe when the accompanying info dated it 1932. 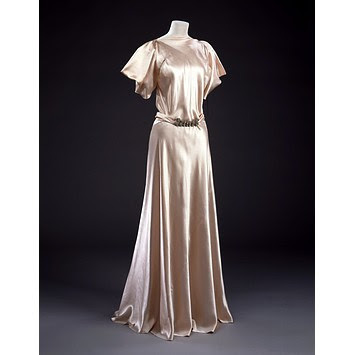 This started a love affair for Vionnet and fashion, design and architecture from the 1930s, and in a dorky way felt the need to ask everyone I know, 'Did you know all these amazing things were being designed in the 1930s?' I'm lucky to have people who indulge me. I swear I haven't been living under a rock. The book is a re-release for Vionnet's 100th anniversary and has of course been blogged about before. 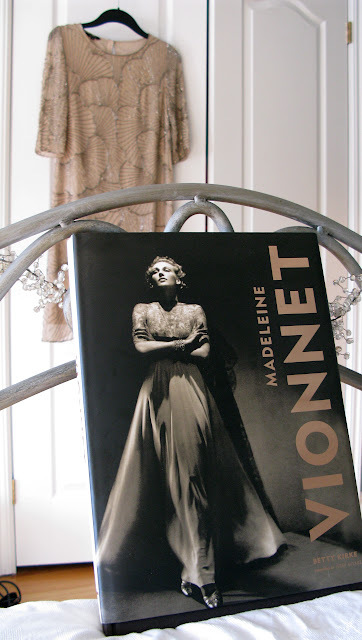 What I love about it is the detailed history and rationale behind Vionnet's designs, the reference to the social changes and challenges she faced in trying to alter peoples' attitudes both in fashion and the workplace, the excellent pattern drawings, delicious photographs and suprises along the way (Madeleine had a thing for bows, too!). Another reason why I love the era so much is that it reminds me of my beloved Oma who was an expert seamstress, and who would have been about my age during part of Vionnet's era. I have so many questions I wish I could ask. I didn't make it. I had every intention of making a dress for a friend's Christmas wedding in Ireland, but as I mentioned in an earlier post, work commitments hijacked my festive time and I was getting slightly frantic as the days drew closer and I hadn't committed to a pattern or fabric. Then, in John Lewis - I spotted this: carelessly deposited, unloved and crumpled on a rack. But it sparkled. It was on sale. It was Vionnet-esque and it was an incarnation of the vision in my mind's eye, in high street form. It was too beautiful to end up on the department store floor. I slapped down my credit card, and when I got home, hung up my dress and poured myself a glass of wine for my good deed, also relieved that I wouldn't be sewing up to the 11th hour (I'd already done this once this year with my dolce vita dress). What can I say? I am flawed. But it may have saved my Christmas. My sanity. And my marriage. And the point: I plan not to fall off the sewing wagon again in 2013. Here's to starting sewing projects earlier! 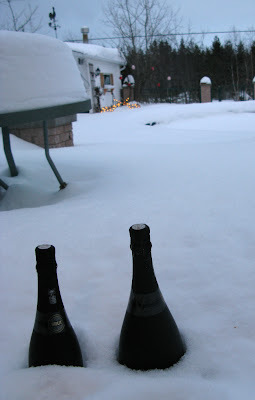 Happy New Year and happy Twelfth Night. Hahaha, I think you did the right thing! Last-minute sewing is so stressful and awful! I'm vowing to start things earlier (or not at all) this year. Ha, thanks for the support! Agree it is too stressful, when sewing is supposed to be stress relief! So happy that you have the Vionnet book! Isn't it amazing? My grandmother was a trained seamstress in the 1930s as well -- still in awe at how quickly she was able to transform my measurements into a pattern and then into a beautiful garment. Happy sewing in 2013! Oh my gosh I love it - it became a must have after I read your post. And so wonderful that you got to sew with your grandmother! I have a couple of garments mine sewed for my mother and I love to examine the stitches. I always think of her when I'm sewing. Best of luck to you this year! Gorgeous book! 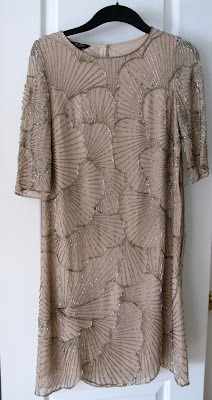 I am drawn to the gowns of the 1930's, too. So elegant. I agree that you did that right thing by buying a dress. It never turns out well for me when I sew under pressure. Here's to no more last minute sewing!